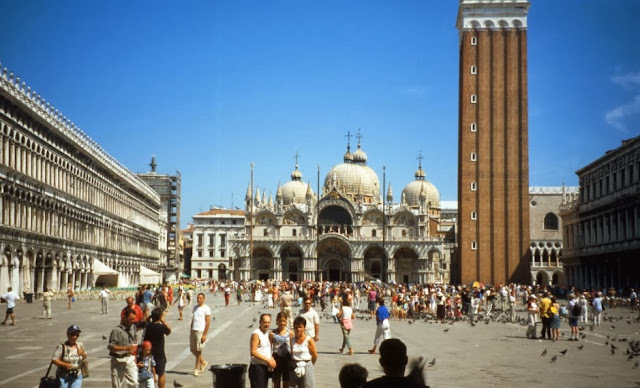 The group of men, having regained most of their composure, wanders back through the twisting streets and passageways of Venice toward Piazza San Marco, where once again they find themselves at Caffè Florian. It is mid-October when temperatures here can drop dramatically for periods of a few days, and when one must be alert to the possibility of the aqua alta, or high water, which can appear quickly and frequently during this season. But today it is warm, and the sun has barely begun its decline; so the artists have gathered with their coffee around a few closely placed tables outside in the still busy piazza. We did see some painting, and some sculpture – and I am speaking here of our traditional understanding of those arts and the materials used to create them – at the Biennale; however those were not the art forms that one would say dominated the event. Our arts are being replaced with "sculpture" made from new and unusual materials, and it seems that painting is the preoccupation of fewer young artists as they turn more and more frequently to new media, just as we once largely abandoned painting with tempera on wood in favour of oil on canvas. Now, as you know, I was never strictly a painter or a sculptor, or an architect for that matter. So I applaud the many new areas of inquiry that I have seen here. As with any other period in the history of art, the great artists of this time will gradually be sifted from the rest. I am certain that in this exhibition there are wonderful practitioners of painting, but I must say that from my point of view, they are difficult to appreciate amid the cluttered spaces I visited. Are painting and sculpture still relevant? Is Bach still relevant, Vivaldi or Mozart? Of course they are, as are we; and so too are those who follow our path. Nevertheless, it occurs to me that perhaps painters and sculptors may now be pursuing something like a classical life as artists. Yo Yo Ma, for example, is an exceptional artist who plays an 18th century instrument with which he sometimes performs music even older than that. Smiling, his gaze directed at the dainty demitasse that he seems preoccupied with rotating on its saucer. Are we ... are you, artists/practitioners of a classical persuasion? I'm not sure I am ready to be relegated to a particular "classical" bin, Leonardo. Ah, screw this "classical" nonsense. We are who we are, and nothing more or less. What is art now? A video of some sourpuss woman saying something, saying anything with intensity? Recorded events of "difficult" things to do as we saw in the Japanese pavilion? The talking trees of the Finns? Who the hell knows, and what's the urgency to know anyway? Time passes. Things change. Despite our deep-seated desire to classify and rank everything, there is never an adequate formula to do so. It's for the young artists, and the young curators to separate the mediocre from the great. Accept things as they are and stop torturing yourselves. There is something about this Biennale that strikes me as being very positive. Look at us, again. No, don't laugh. We are men, we are white, and aside from Leonardo who has never made a firm decision about who he prefers to sleep with (Leonardo grins mischievously), we are all heterosexual. The day of the white, male, heterosexual painter or sculptor is done. Think how, for so many centuries, anyone from anywhere who did not fit that description was considered an outsider. No, that is not correct. Many great artists through time have been homosexuals. But until recently, even they were white men. In this exhibition, we see the work of artists of every race and every persuasion, both men and women, striving to express themselves with clarity and honesty. This is wonderful to see, no?